The Crows Nest is a beautiful one bed room one bath Condominium located a top famous Peg Leg Pete's Oyster Bar. Located directly on Lafitte Cove Marina, and just mere steps away from the Gulf of Mexico. It is minutes away from Historic Downtown Pensacola, the Naval Aviation Museum, the Pensacola Civic Center, and just a free shuttle bus away from all the excursions Pensacola Beach has to offer! 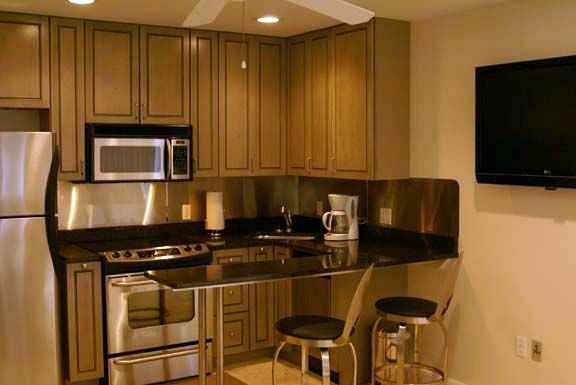 The Crows Nest boasts a fully equipped kitchen with all stainless steel appliances, and granite counter tops. It also features two Flat Panel TVs with external hookups, wireless internet availabilities, travertine floors throughout, and two balconies with breathtaking views of the Gulf of Mexico and the Lafitte Cove Marina. Couples would not be disappointed in this property because every stay you can expect the same wonderful results. The unit is secluded with no neighbors to interrupt your privacy. The staff at the Restaurant below are always happy and helpful to our guest. You get the resort feel without the resort price. Historic downtown Pensacola , is just minutes away with plenty of shopping, dinning and lots of night life , not counting the history museums. Beautiful , Pensacola beach has the whitest sand. The cleanest beach you will ever visit. The view of the Gulf of Mexico is amazing, clear blue waters with plenty of dolphin sightings. Satellite Cable with 800 Channels. Two Balconies with views of the Gulf of Mexico, and the Sound. Two flat Panel TVs. Room Service For Food (20% Service Charge). Reserved Parking Spot. Must be at least 25 years of age to rent. You won't be disappointed w/ the crows nest. Great views and location. Freddie was very helpful! We are property managers in our everyday life so I spent quite a lot of time researching the best place to spend our vacation. After reading all the reviews we decided on the Crow's Nest. Freddie texted us the day of our arrival with check in instructions and said they we excited for us to stay. When we arrived he took us up and gave us keys and all the instructions (remotes, lights, heat, etc). Now I will say the true test of customer service is how an issue is handled. Do they really mean " If there is anything we can do?" Or is it just lip service? We had a small issue and I will tell you that once we texted Freddie, it was handled in MINUTES! Well the first fix didnt work and he personally went up and handled it the second time. We never felt uncomfortable or inconvenienced. He texted several time over the course of the week to see if we needed anything. We never heard noises from the restaurant, which I was concerned about. Coffee on the deck in the mornings was the highlight of our stay. It was a perfect space for 2 to relax and recharge. We loved our stay the Crow's Nest and highly reccomend it to anyone. Pensacola Beach is a wonderful place to create memories. Thank you Freddie! Best kept secret in Pensacola Beach! The Crow's Nest is a special place! We loved it. The bed is super comfortable. Peg Legs food and service was awesome. I’ve been to the crows nest many times before and it never lets me down. The condo is the perfect hidden gem that has you close to the beach but in your own private condo! Can’t wait to come back again!